If you asked me how many protein and/or energy bars I’ve tried, I’d be at a loss. Builder, Luna, Kind, Power Crunch, Lära, Zing, Pro Bar, Amazing Grass, pure, and plenty of others that I can’t remember. There was a period of time where I would find myself at the checkout with 3-5 different brands and flavors. Occasionally, I could almost see the cashier’s confusion in bubble thought form above her head. “Can’t this chick make up her mind?” And no, I couldn’t. I never found one that won me over 100%. Then we made our own. Each bite starts with a chewy brownie crust, followed by a thick, creamy, peanut-butter-flavored layer. 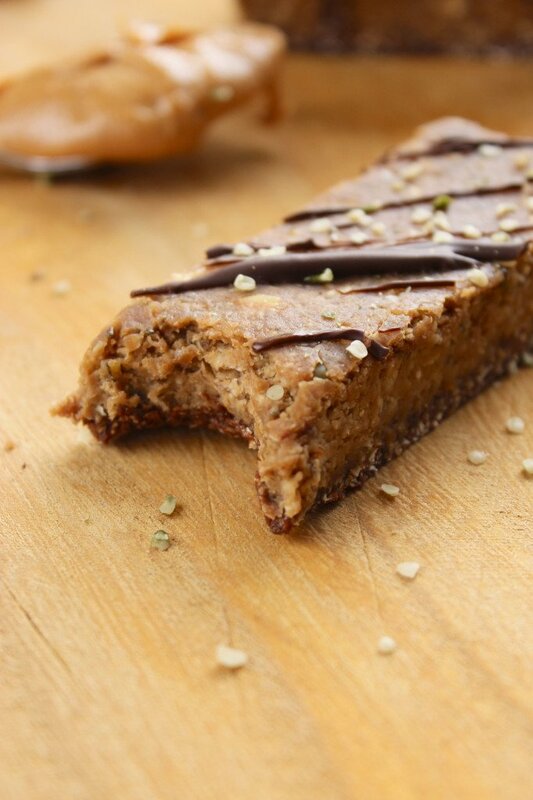 The light chocolate drizzle and sprinkle of hemp seeds adds a hint of sweetness and a crackling finale to the bars. At 16 grams of protein each, you can consider me a repeat customer. Two bowls, a food processor, and a parchment-lined baking pan are the only necessities for this recipe. With just a few, fool-proof steps, these come together in under 20 minutes. Chill them for an hour and you’ve got snacks for at least a week’s time. I admit, I have a soft spot for homemade granola bars, but these serve another set of needs. Where our granola bars are sweet, fruity, and light, these are hearty, filling, and indulgent [and guilt-free, to boot]. I’m a huge fan of simple recipes, especially when they’re inexpensive. If you have all of the ingredients on hand, this batch of protein bars rounds out at $1-$1.25 per bar [depending on where you live]. Considering the average protein bar costs $2.50, these are a bargain. And when you factor in the cost of all the questionable, mystery ingredients in most store-bought brands, you’re ahead of the game with these homemade bars. We like to make ours in an 8×8 baking sheet lined with parchment. That way, after they’re chilled for a bit, the whole slab can easily be lifted out of the pan and cut into bars, squares, bites, or whatever you happen to be craving. I love to portion them into bite-sized bits that I can grab whenever I have a chocolate and/or peanut butter craving. Throw one of these into a bag for a midday pick-me-up or a post-workout refuel – unless it’s a super hot day, there’s no need to keep these chilled. For day to day storage, I recommend keeping them in the refrigerator to keep them fresher, longer. I love that, unlike a lot of homemade protein bars, these don’t melt as soon as you take them out of the fridge. Ain’t nobody got time for that. We’ve got 6 bars left right now. Along with the leftovers of two other recipes, they’re relaxing in the refrigerator, seducing us every time we open the door. 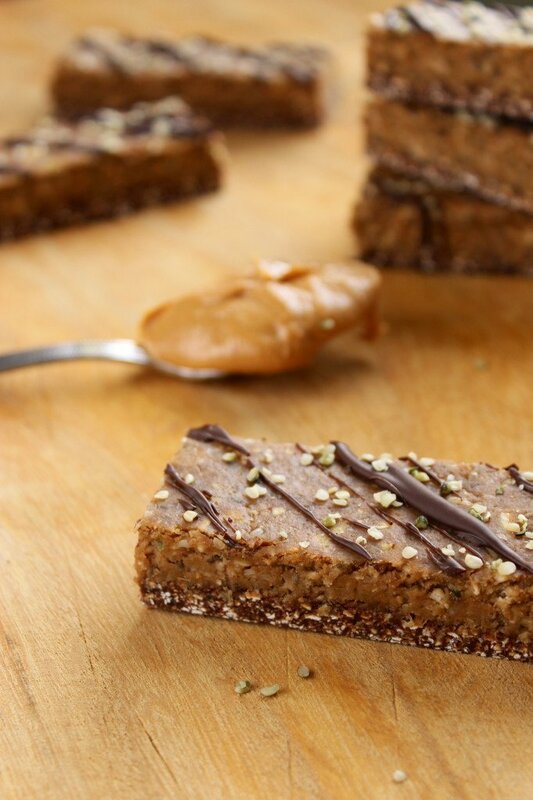 Sure, we just gorged ourselves on a shameful amount of pan-roasted brussels sprouts, but is that going to stop us from enjoying a chocolate-laced, protein-packed, peanut-buttery, post-dinner treat? Nope. 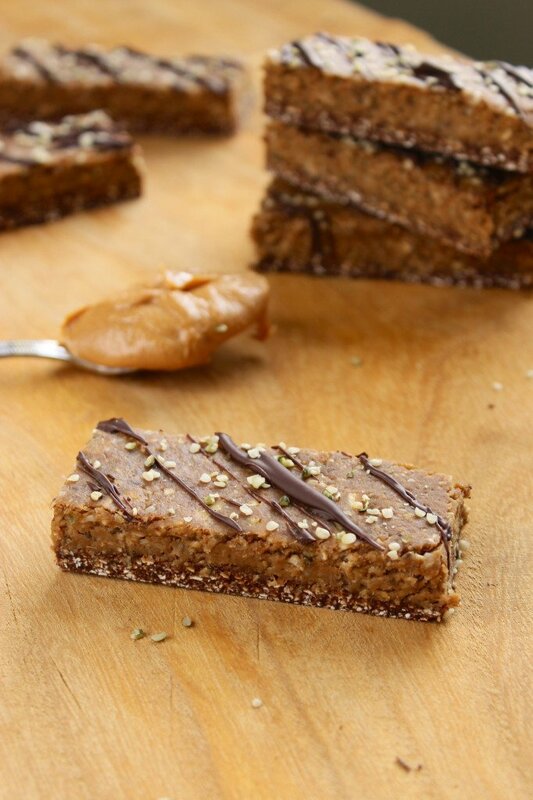 Easy, no-bake protein bars – vegan and gluten-free! 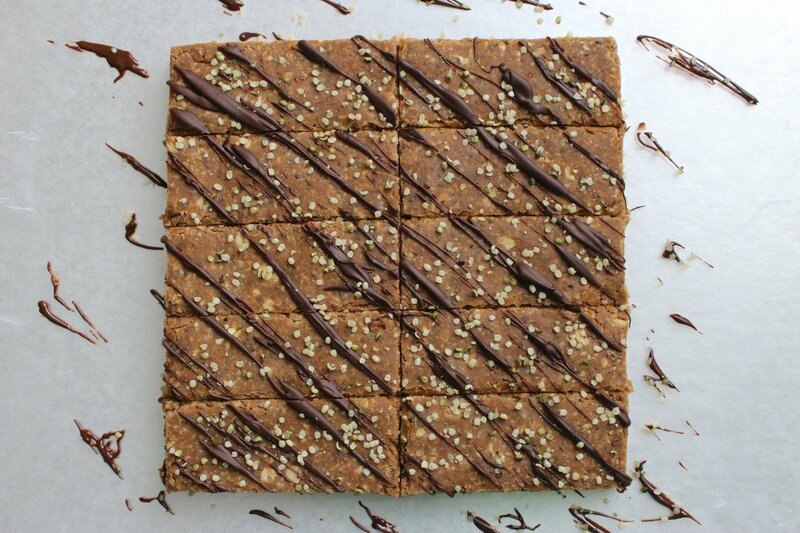 Chewy brownie crust and thick peanut butter layer, with a chocolate drizzle and hemp-seed topping. 16 grams of protein per bar. Combine ingredients for crust in the food processor until a crumbly, thick dough forms. Dump into a bowl and set aside for later. In a large bowl, combine dry ingredients for the next layer. Use a fork to mix well. Combine flax and water in a small bowl, stir, and set aside for a few minutes until it starts to gel. Add agave or honey, peanut butter, coconut milk, and flax egg to the dry ingredients. Mix roughly using the fork, then add mixture to the food processor. Blend until the mixture is smooth – adding more coconut milk if it is too dry. It should be thick and sticky when you’re finished. Line an 8×8 baking pan with parchment. Dump crust into the pan and press it out as evenly as possible. It helps to use a miniature rolling pin or the bottom of a drinking glass! Dump the next layer on top the smoothed crust and spread it out. Don’t be afraid to get your hands dirty – this recipe calls for it! Set the pan into the refrigerator for 1 hour. If desired, make the chocolate drizzle while the bars chill. Melt 1/3 c. vegan chocolate chips in a double boiler. 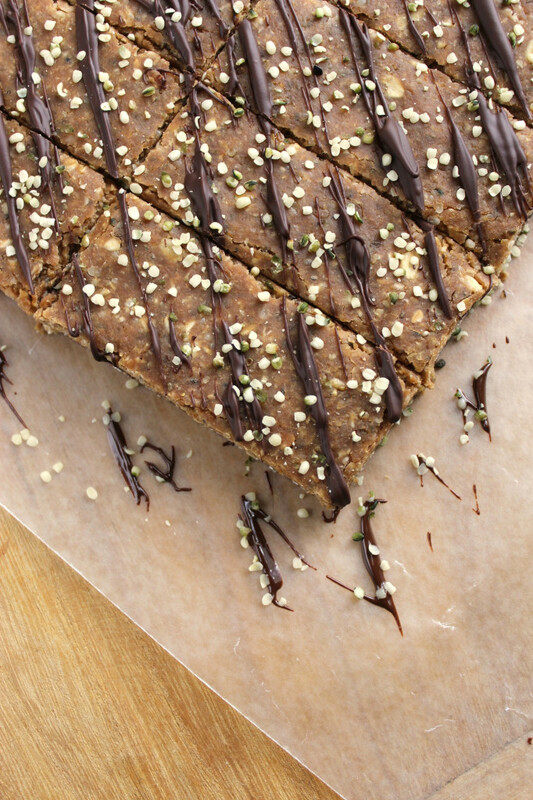 Lightly drizzle the chocolate across the bars and sprinkle hemp seeds over the top. What would suggest as a substitute for the hemp seeds? I’m allergic to hemp. More chia seeds? Some other seeds like sunflower? You could definitely use sunflower or chia seeds! Would it ruin the consistency to skip the agave/honey? We don’t do a lot of sweet if we can help it, but the rest looks great! I did scroll and scroll to see if that question had been answered, but didn’t see it. It would definitely affect the consistency. You could probably sub brown rice syrup as it’s not quite as sweet. Let me know if you try! You could use coconut oil to bring the crust together and maybe not use as much honey in the filling ! I’ve never tried that before, but it’s certainly worth a shot! I am looking forward to attempting the recipe for these, but wanted to check the gram measures where you’ve listed cups? Nutritional value of carbs, fats, sugar please. I’ve updated the recipe to provide the requested nutrients. They were all in there at some point… I’m not sure why they disappeared! Thought you’d might like to know these bars are not gluten free since they have a rice component to them. All grains have gluten. Our society just convienently forgets that with regards to rice as it tends to be a major component of “wheat gluten free” diets in the West. My husband, who is allergic to rice gluten, has had more reactions than I care to think about from well meaning people that say “oh it is gluten free, you’ll be fine” who don’t understand the basics of grain morphology. The recipe looks great to try other than the rice part.I’d just remove the gluten free part. Awesome – I ended up making these and they came out great. For anyone with a food processor, you can just blend rolled oats to make your own oat flour and you can also easily make your own peanut butter. I also ended up using almond milk instead of coconut and used some rice puffs. Thanks for commenting! Definitely easy to make your own flours in a food processor. :) Adding rice puffs is a great idea for some crunch! Firstly, I loved your recipe! 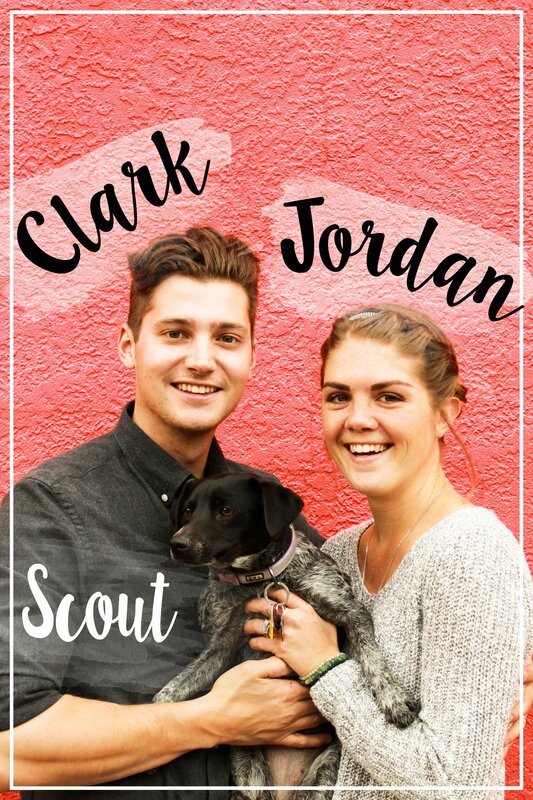 Secondly, I’m from India, and seeing you and Clark together really makes me happy. Great going! Since I recently started working out, I am really tempted to try out this recipe. However, my only concern is the uncooked oats flour and rolled oats. I don’t think my tummy will have a good time digesting it. Can you please suggest a remedy for this? Don’t have all the ingredients..
And is there any other option besides for flax egg? I am thinking about making these and subbing Dates for the dried apricots and using less sweetener in the crust or is the rice syrup necessary for holding the crust together?…wondering if you experimented with other ingredients? Alright…I made these today. The crust turned out PERFECT, however the top layer did not set, I followed the recipe to a T :/ I am not sure if I can even salvage them, they are in the freezer right now. Any ideas? I am either thinking that I should just food process the whole thing together or maybe bake them for a bit? They do require refrigeration to get the topping to set. You should be able to refrigerate them for a while and it will harden. Hopefully that helps! Hey! I was wondering if the apricots could be subbed for dates? If so how many dates do you think I’ll need. These look delicious btw!! Apricots are usually smaller, so I would say use 4-5 dates if you decide to substitute. Enjoy! 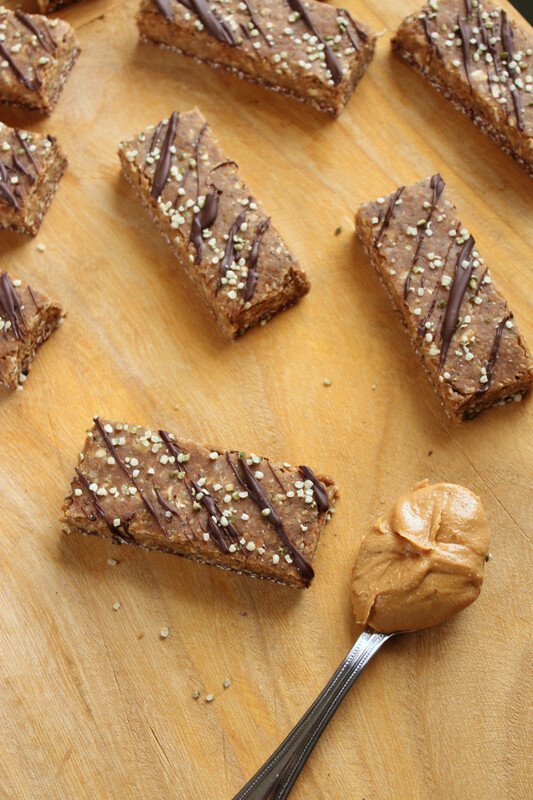 Wonderful protein bars! I am making them in batches for the week. So much better than buying them at the store. Thank you! Thank you for taking the time to share this lovely and delicious recipe. These are what I’m looking for! Was curious if you did a calorie study on how many calories per bar? I could always enter it into MyFitnessPal as a recipe, but wanted to ask. Thanks. These end up being between 230 and 260 calories per bar depending on the ingredients and size that you go with. Enjoy! Hi do you think I could replace the protein powder with chocolate flavoured raw meal instead? These look yummy, I made them and the bottom was super crumbly and didn’t hold together. I think if I make these again I’ll just do the top layer-which is fantastic. Thanks! Maybe I’m calculating things incorrectly, but I estimate around 11g of protein per bar. Am I missing something? I really love the taste of these bars, but I’d like a bar with more protein. Hmmm… I’m not sure why we came up with such different results. We used MyFitnessPal and came up with 16 grams of protein. A lot of it depends on the brand of ingredients and the program that you use to calculate the nutritional facts. Sorry for any discrepancy – but glad you like the bars! I also came up with about 11g protein per bar and used my fitness pal. Glad you enjoyed them! We must have selected different brands of ingredients for us to have come up with different protein contents. These look amazing! I tried to make them, but the base didn’t come together properly. Also wasn’t sure when to add the flax egg, as it’s not mentioned in the steps. So sorry for that confusion – I’ve corrected it to make it more clear. The flax egg goes into the dry ingredients when the other wet ingredients are added. Hope you try again with success! Awesome! Thanks for clarifying. I’ll definatley try again. My kids loathe coconut milk, would a blend of coconut and almond (a la almond breeze) suffice? Do we have to use gluten free flour? Not sure if you’re trying to accommodate gluten intolerance or if the gluten will screw up the consistency, binding, etc. I appreciate that you included the option of agave or honey. I can’t eat agave, so it’s always nice to know when there are substitutes that will maintain the integrity of the recipe, even if they’re not strictly vegan! Oats are gluten free. The only reason there are oats labelled gluten free is because some oats are processed in facilities that process gluten containing grains. For some people a little cross contamination can be a serious issue. For this particular recipe just go ahead and use plain old oat flour. Or do what I do and make your own oat flour from rolled oats. Can these be frozen? I’m the only one that is gluten free in my family. Sure they can! Give them some time to thaw, and thaw them in the fridge if possible. Thanks for the tip! As you’ll see, it says agave OR honey. We purposely left the decision up to each vegan or non-vegan. Because not everyone thinks that eating bee poop harms bees. Just FYI, it’s not always about whether you’re hurting animals. Using animals as commodities is not vegan. That’s why we included agave, then mentioned the honey option. It’s a good note to provide readers with. Some people prefer to use honey over agave. Not everyone is a vegan and not everyone can tolerate agave, so we try to respect people with different dietary needs. Can I have calorie counts? 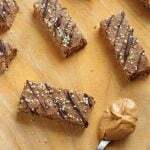 I buy store bought protein bars mainly because I want to know calorie stats, but i would love to make these!!! They’re about 250-275 per bar if you cut them into 10 bars. :) Hope you enjoy! 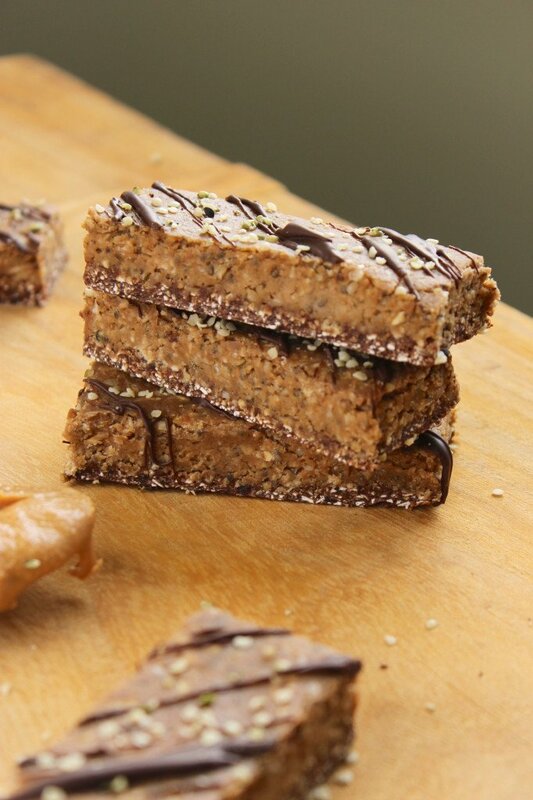 These are seriously the most beautiful homemade protein bars I’ve seen on any blog!! Definitely going to give these a try–I’ll let you know how they turn out! Wow! You are too kind! They are a home run, for sure. Everyone in my entire family loved them. Can’t wait to hear what you think! These look so good! I love the idea of a “flax egg” to help bind the bar. Great idea! I will have to try that for my next bar recipe! Thanks for sharing! These look delicious. I am always looking for high protein snacks. Would these travel well at room temperature?